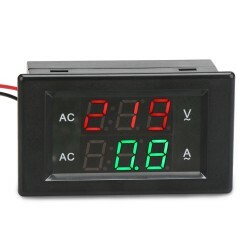 It is a 2in1 Red/Blue Led Display Digital Voltmeter Ammeter, Measure Voltage range: 0.0~600V, Measur.. It is a 2in1 Volt Amp Panel Meter, Measure Voltage Range 3 Phase AC 200-450V,Measure Current Range 0.. It is a 2in1 Digital Meter/Digital Voltmeter Ammeter, Measure Voltage Range AC200~500V,Measure Curre.. It is a Digital Meter/Voltmeter, Input voltage: 60~600V, Measuring range: 60~600V, Color: Red, yello..
Digital Multimeter AC 200~450V 220V~380V /100A Multifunction Voltage/Current/Active Power/Apparent.. It is a Digital Meter/2in1 Digital Voltmeter Ammeter, Measure Voltage Range AC100~300V,Measure Curre.. It is a Digital Multimeter 4in1 Voltmeter/Ammeter/Power Meter/Energy Meter, Working Voltage: 80 ~ 26.. It is a 2in1 Volt Amp Panel Meter, Measure Voltage Range AC200-500V,Measure Current Range AC0.1-50A .. It is a 2in1 Volt Amp Panel Meter, Measure Voltage Range AC 80-300V,Measure Current Range 0-50A (bui..
AC 80.0~300.0V/100A Digital Multimeter 5in1 Voltage/Current/Active Power/Reactive Power/Power Fact.. It is a Digital Tester/Multimeter, Working voltage: 80 ~ 260VAC, Rated power: 22kW, Operating freque..
Digital Multimeter AC80~300V (110V~220V)/ 100A Multifunction Voltage/Current/Active Power/Apparent.. Copyright © 2019, Droking.com, All Rights Reserved.